The full name of this city is São Sebastião do Rio de Janeiro. Rio de Janeiro literally means January River. The name is received from the crew of the Portuguese ship that landed in the local bank of January 1, 1502. Another name of Rio de Janeiro is Cidade Maravillosa, which in turn translates into "wonderful city". Brazilians believe that God created the world in six days, but the seventh is devoted to Rio. Rio de Janeiro is one of the most remarkable and dynamic coastal cities in the world. It is located on the South Atlantic, in Southeast Brazil, the center of the state of Rio de Janeiro. It is the second largest city in Brazil after San Paulo, and from 1764 until 1960 serves as the capital of the country, then the main location moved to Brasilia city. Rio de Janeiro during the carnival is a dream for every traveler at heart and each passionate lover of dance and hot emotions. Many who have had the pleasure to visit this grand entertainment extravaganza, which is probably the most advertised of all similar festivals around the world, believe that the perspective on Latin American rhythms and fun way of Brazilians is something you will remember forever. The carnival in Rio de Janeiro continues for nearly two weeks, starts on Saturday, 40 days before Easter and ends on Tuesday, the last day before the fast. Along the street there are about 70, 000 seats, but few are those who have come to sit at the "dance fortuna". Annually, during the Carnival in Rio de Janeiro arrive between half and one million tourists from around the world. To become part of the event of the year in Rio, however, you must buy a ticket in advance, the price of which varies between 100 and 500 euros. If you intend to get them, you have to hurry because tickets are gone on the first day of putting them on sale. Rio de Janeiro is named in tribute to King Sebastian I. In 1567 the village numbered 3, 000 people, most of whom were local farmers, mainly engaged in fishing, especially whale hunting and the manufacture of sugar products. In the late 17th century the gold rush in Minas Gerais, located northwest of Rio de Janeiro, gave impetus to the development of the city. The Portuguese influx turned Rio de Janeiro into the most important port here. The arrival of the Portuguese royal family in 1808 turned Rio into the temporary capital of Portugal, and the city's population jumped up to 70 000 people. The nature around Rio de Janeiro is an unique combination of sea, mountains, woodlands and attractive rocky pinnacles. Copacabana beach is probably the most famous beach worldwide. Daytime and nighttime entertainment does not stop here and there is always the rhythm of Samba. On the promenade "Avenida Atlantica" are concentrated the best restaurants - cafes, restaurants, bars, discos. 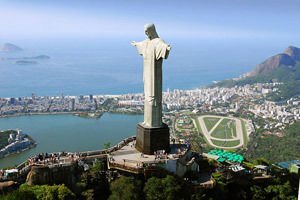 The undisputed symbol of Rio de Janeiro and one of the most exciting places in the city is Corcovado mountain where the famous statue of Christ stands, with arms outstretched. This structure was built on a 6-foot pedestal and the statue itself reaches a height of 30, 5 meters. The symbol of Rio de Janeiro can be reached by a funicular, built in 1885, or through the winding road up. On the way up the mountain Corcovado you see one of the most beautiful and fascinating views of Rio. 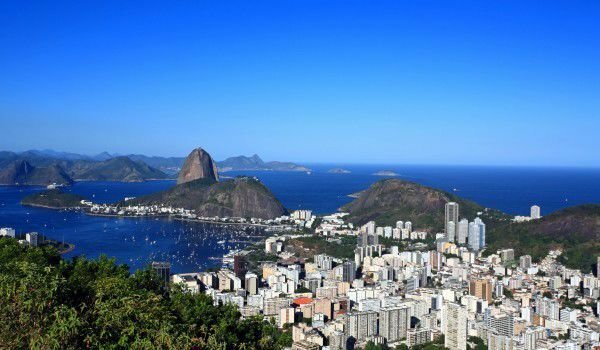 Another excellent place where you can enjoy the "wonderful city" is Pao de Azucar, which is also a symbol of Rio de Janeiro. It can also be reached by road, running from the city center, or by gondola.